John Speed (1552-1629) is one of Britain’s best known map-makers. He produced the first national atlas of the British Isles in 1611, the grandly titled Theatre of the Empire of Great Britaine, which contains 67 folio maps under the grandiloquent sub-title of ‘Presenting an Exact Geographie of the Kingdomes of England, Scotland, Ireland and the Iles adioyning: With the Shires, Hundreds, Cities and Shire-townes, within ye Kingdome of England. The Dorset map, measures 51 x 38 cms (20 x 15 ins) and includes two new features of map-making for which he was responsible: inset plans of county or principal towns, and the delineation of parish hundreds (the basis of the organisation of public justice and the administration of public finance throughout southern England) with dotted lines.Here the inset plan of Dorchester in the top left was the first map of the town to be printed. The street pattern is largely accurate, although Trinity Street is missing and many of the angles are wrong. We know that High West Street was fully lined with houses, whereas Speed shows some gaps. Speed himself surveyed the majority of the new town plans, hence the wording ‘Scale of Pases’ under the dividers. This was a time-honoured scale based on a natural walking pace, which can be remarkably uniform, using the legs of a skilled surveyor like Speed. 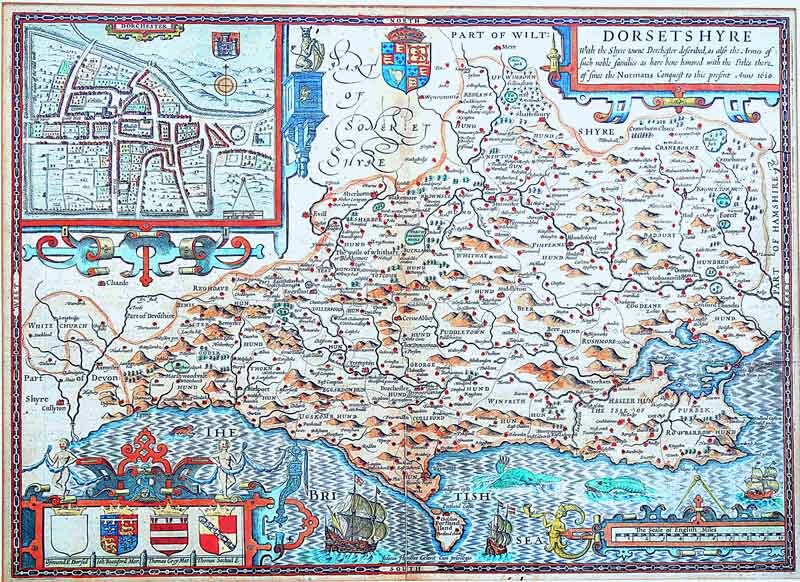 The Dorset map, abandons the custom of indicating compass points with Latin in favour of anglicised East, West, South and North. The coats of arms are arranged decoratively in the lower left-hand corner. The first represents Osmund, Earl of Seez in Normandy, who was made Bishop of Salisbury, Lord Chancellor and Earl of Dorset by William the Conqueror. He died in 1099 and his shield is blank because there was no formal system of heraldry then. The second coat of arms is that of John de Beaufort, son of John of Gaunt, Earl of Somerset. He was created Marquis of Dorset by Richard II, as was the owner of the third coat of arms, Thomas Grey, by Edward IV. The fourth belongs to Thomas Sackville Esq, who was born in 1536, was created 1st Earl of Dorset by James I and died in 1608. He is accorded especial honour on Speed’s map, because his escutcheon appears again on a plinth to the right of the town plan. Other decorative features are the royal coat-of-arms, the sea monsters, the galleons in full sail, the swag-holding maidens atop the armorial cartouche and the horn-blowing mermaid beside “The Scale of English Miles’. Single photographic image of framed print.